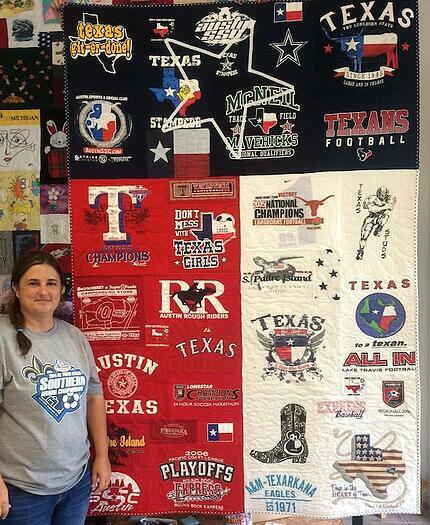 Too Cool T-shirt Quilts - Austin is located in Round Rock, Texas and owned by Michelle Bailey. Michelle found the Too Cool method of T-shirt Quilts about 8 years ago when her oldest daughter was a Freshman in High School. 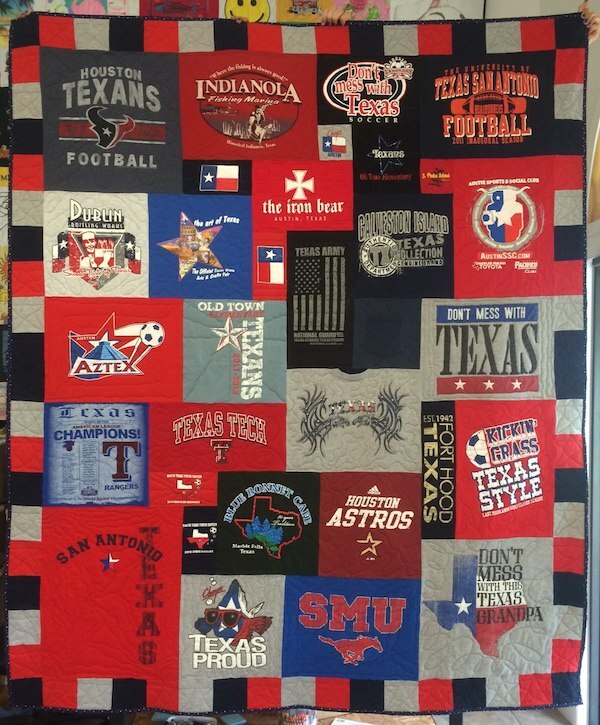 Knowing that she wanted to make a t-shirt quilt for her daughter’s HS graduation and knowing she needed time to practice before creating the lasting memory of “prized” T-shirts, she began learning all different types of quilting. When searching for a way to make the T-shirt quilt, she knew she didn’t want the extra step of stabilizing the t-shirts and making them “stiffer”, she also wanted to be able to do more than 9 or 12 same sized blocks. She knew her daughter’s T-shirts ranged in size and quantity. A google search brought her to the Too Cool T-shirt Quilt website. She bought the book and templates and has been hooked ever since! In 2014, she quit her corporate job to do what she loves (T-shirt Quilts, of course!). She formed her own company Sharpy Creations, LLC, and signed up as a franchise of Too Cool T-shirt Quilts! She now has 3 employees working with her in creating these beautiful quilts and looks to be growing again soon. Quilt Only single sided and double sided (for those that put the top together themselves, we quilt it for them).